Gretsch uncovered a set of Baldwin-era Filter'Tron pickups with incredible punch and twang - perfect for the G5420T Electromatic single-cutaway hollowbody. They reverse engineered those special pickups to create the set of "Black Top" Filter'Tron humbucking pickups that you'll find loaded in this G5420T. With their robust character and trademark cut, the Gretsch Black Top Filter'Tron humbuckers keep you ready for everything from rockabilly and country to blues and classic rock. 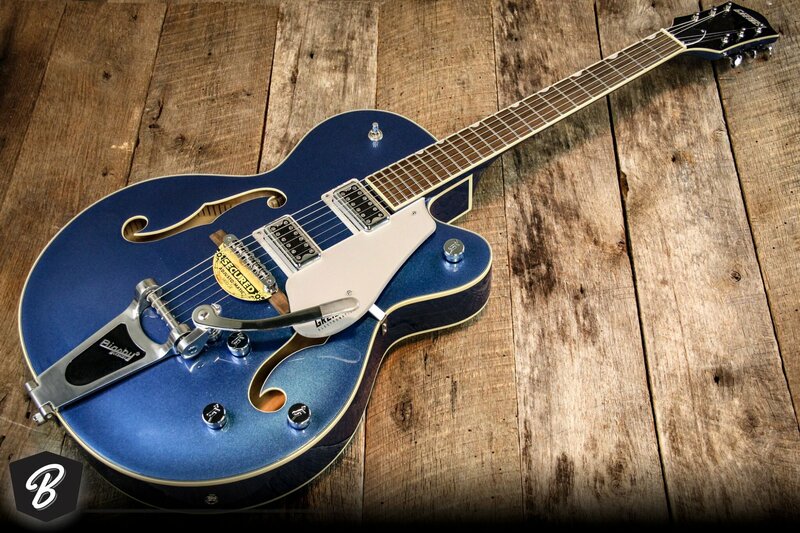 The Gretsch G5420T Electromatic allows you to pull off a lot of tonal tricks. Volume controls for each pickup help you create a perfect balance between warmth, bite, and brilliance when both pickups are engaged. The master tone control lets you fine-tune your sound once you've got the pickups dialed in. And thanks to the master volume control, you can take your tube amp from clean to growling without changing the balance between your pickups. And of course you'll get sweet tone from the neck and bridge pickups individually. Nothing beats the character and vintage vibe that the Bigsby-style tailpiece adds to the G5420T Electromatic single-cutaway hollowbody. Based on the original design created by Paul A. Bigsby, the Bigsby Licensed B60G tailpiece requires next to no effort to use, making it particularly easy to pull off slow, subtle, and extended bends. You'll be able to bend into notes, give full chords vintage-sounding modulation, and imbue single notes with a character that isn't attainable through other setups. Sweetwater guitarists agree, a vibrato like this is part of the sound of Gretsch.